Oo. Leave it to DeAnn to come up with the best line of them all. “Before Katniss, there was Karana”. I am so quoting you on that, m’dear. Beautifully put. 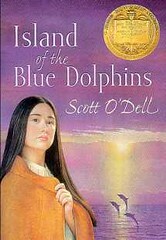 Hazel Rochman’s “Another Look At: Scott O’Dell’s Island of the Blue Dolphins” found in the April 15, 2007 issue of Booklist makes another interesting point. 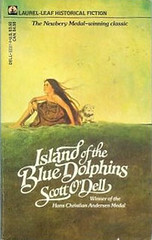 “Readers familiar with children’s literature will know that … Scott O’Dell’s Island of the Blue Dolphins, Newbery winner in 1961, also wins the endurance race, but it’s doubtful whether the experts of the day would have predicted it to outlast Walter Edmonds’ The Matchlock Gun, Newbery winner in 1942. Edmonds’ novel had the feel of a classic western, High Noon for kids. 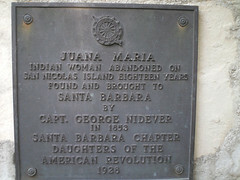 What we didn’t know then was that our interpretation of what appeared at midcentury to be an archetypal story, settler versus Indian, would change dramatically in the late 1960s and beyond, leaving readers with zero tolerance for passages describing Native Americans as savages who looked like dogs.” Not to give anything away but The Matchlock Gun does not make it onto this Top 100 Children’s Novels List. It never even got a single vote. 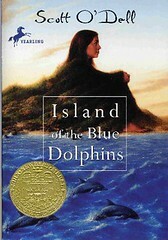 And he was a first time 60-year-old children’s author who won a Newbery! The year it won it beat America Moves Forward: A History for Peter by Gerald W. Johnson, Old Ramon by Jack Schaefer, and The Cricket In Times Square by George Selden. Fifty points to anyone who has read all four of these. 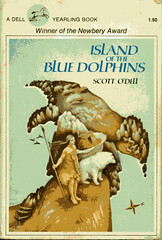 You can read more about Scott O’Dell himself here. 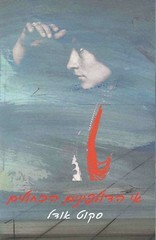 A book was written about the woman who inspired this novel, called Lone Woman of Ghalas-Hat. 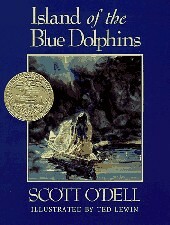 In 1982 the Scott O’Dell Award for Historical Fiction was established. 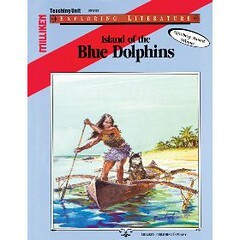 Each year it goes to the most notable work of historical fiction for kids. The choices, for that matter, are often stellar. 100 Scope Notes re-covered the book here. A bunch of covers to pick from this time. There was a movie in 1964. It was apparently just awful. Gee, can’t imagine why. After all, with a tagline like “A Girl’s Incredible Adventure on a Lost Island!” and a pretty clearly white heroine who wears a short buckskin skirt the whole time, what’s there to possibly object to? Obviously I much prefer the 90-Second Newbery version done with oddly bloody claymation.